The Poodle is one of the world's most popular and most well rounded purebred dogs. Because of this, the poodle is the most commonly used dog breed to create new hybrid dog breeds. 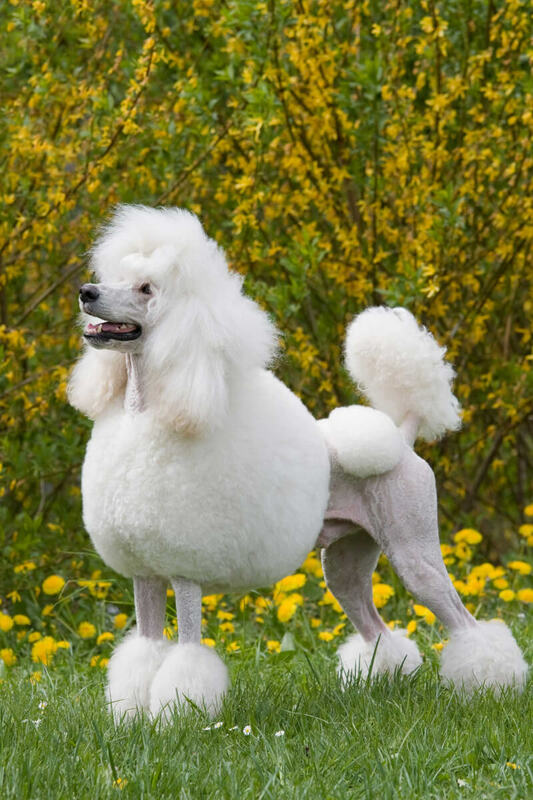 Today most people associate the poodle with luxury, class, and frequent visits to the groomer. However, what most people don't realize is the poodle is an extremely intelligent dog with skills that most are unaware of. Due to the popularity of the poodle, three sizes exist. The standard poodle, the miniature poodle, and the toy poodle. The popularity of the Poodle breed cannot be denied, and even the term itself is popular. If you happen to hear about a "POODLE attack," it's often about a way to exploit Internet browsers. That's not to say that there are not attacks involving Standard Poodles, a child, or even a baby, just that this is not about the poodle attack explained regarding hacking. This is about Poodles that were used for hunting and now are almost found as house pets, lap dogs, and fashion accessories. 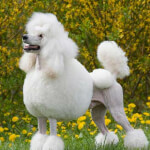 Because Poodle dogs are so prevalent, you should know as many facts about these dogs as possible. Despite their history, they are not naturally vicious or dangerous. Like any dog, they can be made mean and have behavior problems because of the way humans treat them. The poodle is one of the world's oldest dog breed which was originally bred in Germany for hunting waterfowl. This hunting instinct has stayed with the breed ever since and poodles make some of the best water retrieving dogs out there. Their size, coat, and personality all aid them in jumping into water and retrieving waterfowl. Poodles are extremely intelligent and loyal dogs with an eager to please attitude. They can get mischievous, especially if they are bored and are unexercised. They are very alert dogs and make good watch and guard dogs. While they are friendly to children, pets, and everyone in their family, they may take a while to warm up to new strangers. The poodle's coat is one of it's most sought after features (and is also why the dog is used as a parent breed for many new hybrid breeds). Unlike most dogs, the poodle does not shed making their coat hypoallergenic. Poodles are a well-rounded dog breed that can easily adapt to living in many different environments including a house, ranch, or a small apartment/condo. Before the Pudelhund were dogs with curly coats that came from central Asia, and it was from these dogs that Poodles originated. They were used as dogs of war by the Romans, they were popular among armies of Eurasia, and they were called Barbets. By the 15th century, they had spread through all of Europe. 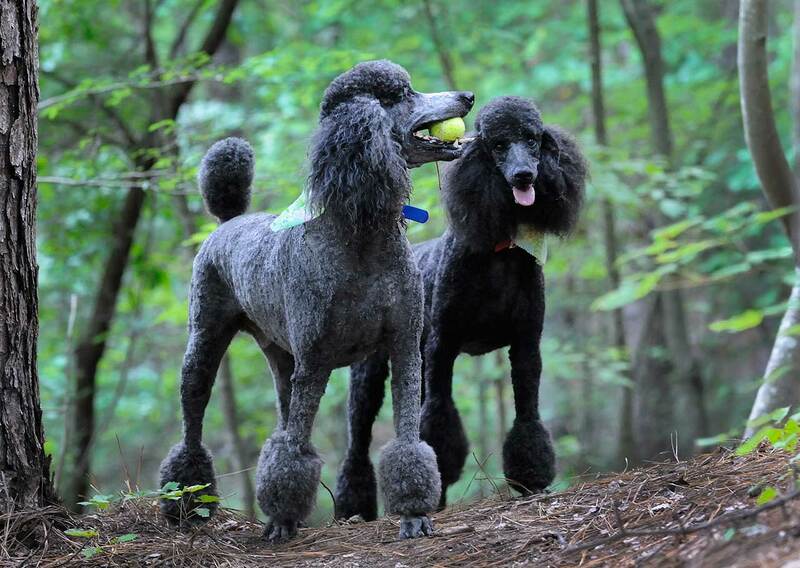 Some of the countries the Standard Poodle's ancient ancestry was found was Russia, Hungary, and France. In the 18th century, those that were taken to what we now know as Germany were bred with rough-coated water dogs for certain types of hunting. Those types eventually became the Pudelhund. It was also during the 19th century that the Poodle's association with France grew larger than life and created the idea that these dogs originated from that country. French royals and nobility loved the Poodle, the dog's curly coat, and the way that that coat could be groomed into outrageous styles. This "Poodlarity" ballooned into the 20th century as the breed was taken overseas into the United States and dog shows there as well as in England. After World War I, however, the breed's bouffant hairstyles had reached its peak, and they became a little less interesting to the general public. These days, these dogs are again popular. This breed's appearance may be well-known to most folks. Still, there are those who may ask, What does a Poodle look like? The anatomy is not unique but is memorable — especially the Poodle coat! These dogs are not quite squared in dimension although their coat styling might give them that appearance. The long, narrow snout leads back to a small, domed head. Poodles have round, black eyes that peer straight ahead while separated slightly by the rise back from the nose which makes the face look long. Eye and nose color is dependent on coat color. The ears are long and fall straight down. The neck is strong, moderate in length, and curves slightly down to a torso with a deep chest. The second most noticeable characteristic is the length of the legs. Unlike the smaller variations, the Standard Poodle has long legs. The front legs are straight and the hind legs are angled rearward and are especially muscular in the hips. The paws, or feet, are small. The typical Poodle tail is docked, but when it is natural, it is medium-length. The skin is neither tight nor loose, and there should be some easy movement when rubbed. Poodles come in all colors, and they are typically solid. There are those that have two colors and ticking, however. 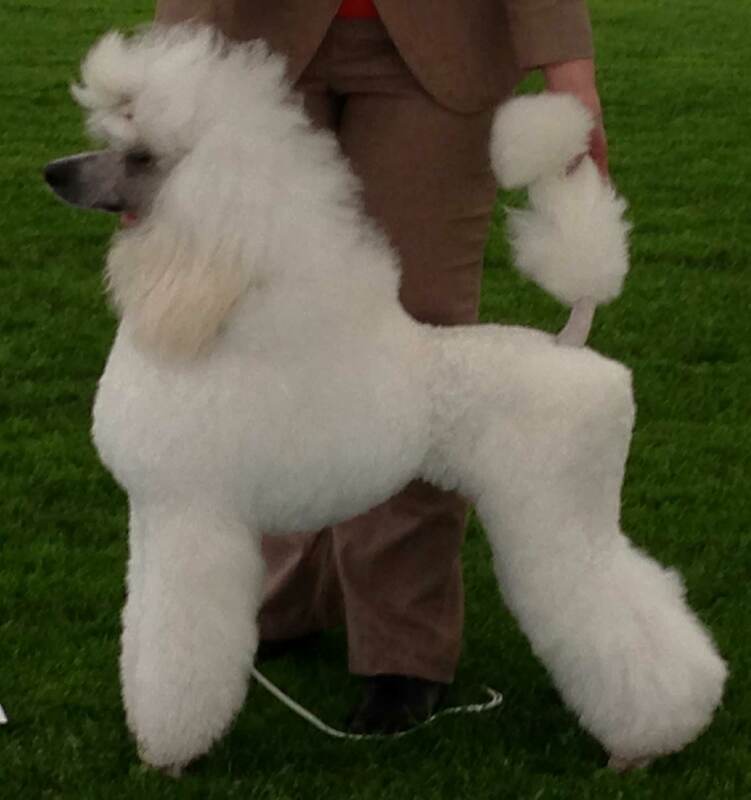 Parti Poodles are white with a second color on top of the white and can be in mot any pattern. Coloured Poodles, like purple, cinnamon, or orange, are not rare colors. They are those whose coats have been dyed, so if you see an unnatural looking one, it is most likely because of the owner. There are also try color and the rare phantom Poodles. Poodle size is larger than most people think. We're inundated with the smaller versions of Poodles, and when you meet one of these Standard-sized dogs, it can surprise you how big they are. It may interest you to know that the American Kennel Club recognizes Poodle varieties by height and not weight. 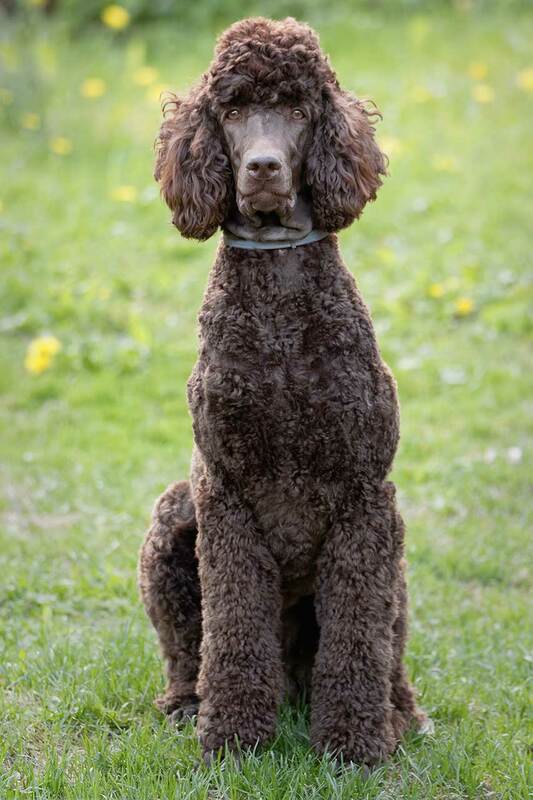 A full size, mature Standard Poodle male has a typical weight of 45 to 70 pounds but is often on the lower end. Females weigh approximately 5 pounds less on average, and they tip the scales around 40 to 50 pounds. As for weight, this variety, male and female, stands at least 15 inches tall and can be up to 18 inches — or higher! There are just three Poodle varieties, and they are all based on size. Those regarding the coat style are not recognized as variations by the big kennel clubs such as the AKC. Coat type is a type of Poodle that is not really recognized as a variety. There are the curly coats, and there are the corded coats. (Wavy is not a proper description for this breed, it should be noted.) The curly version is the one we've all seen. The corded Poodle coat is where the curls are like certain sheepdog breeds. With the corded Poodle, the hair grows into rope-like strands, and these are called "dreds." Due to this breed's huge popularity explosion, based primarily in the dogs' hypoallergenic coat, there are a great many sizes. Many terms are used to describe the sizes, and most of these terms are not standardized or recognized, universally or otherwise. The formally known terms are the Standard Poodle, which is the largest of the three variations. The middle size is the Miniature Poodle and is medium in its height. The smallest of the three is the Toy. It is the Toy Poodle that has nearly all the non-standard names. This varietal is the most popular and may be called the teacup (or Tcup), mini, micro, petite, dwarf, pocket Poodle, etc. 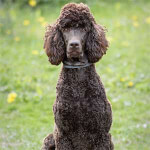 There is a growing crowd that is hoping to introduce a new variation, the king Poodle. These dogs are giant in size and are significantly larger than the Standard. For the most part , the king is not presently recognized other than by people seeking to breed and sell them. Most people think that a Poodle's a Poodle, no matter the size, variety, or coat style. To an extent, this is true. After all, the three size varieties and two coat types all fall under one breed. Still, size seems to make a difference in this breed's personality, better known as Poodle temperament. The difference in the dogs' characteristics are probably subtle. They are most likely unnoticeable unless you have one of each variation present to watch their behavior. Overall, these dogs are very trainable, extremely loyal, and highly intelligent. Because of their loyalty, they'll be aloof to strangers. The Standard Poodle is not aggressive unless there is an actual threat. The two smaller types, the Mini and the Toy, might be less secure and more apt to bark and take what they imagine is a strong stance. Also, the Standards tend to feel secure enough to not have to follow their master or family members around all the time. When it comes to the playful traits, these are more often found in the Toy and Miniature Poodles. They seem to understand that the strength comes not in brawn but in clownishness and mischief. If you are wondering, Are poodles good with kids?, then wonder no longer! Unlike some breeds where the answer is a flat No, there are some things you should know. (It should be noted that there are no dogs where the answer is simply Yes.) All three size types are good family dogs depending on the kind of family. When it comes to kids, however, Standard Poodles are the best. Still, even they are not suited to babies, toddlers, or very small kids. Nor are they friendly with children that insist on being rambunctious. While Standards tend to be confident because of their size, this same characteristic might present a danger should they accidentally knock over a toddler. As for Miniatures and older kids, this should be OK, and you should be sure to teach the kids how to behave around dogs as much (if not more!) than you train the dogs to behave. Toy Poodles are the least suited for kids or even large families of mature members. Poodles generally like other dogs, and with a little work, they can get along well enough with your cats too. They may not be so kind toward neighborhood cats, however. Poodles have a high prey drive regarding little furries. Squirrels, hamsters, gerbils, and such creatures — inside and out — will get their wide-eyed interest and almost always be chased. 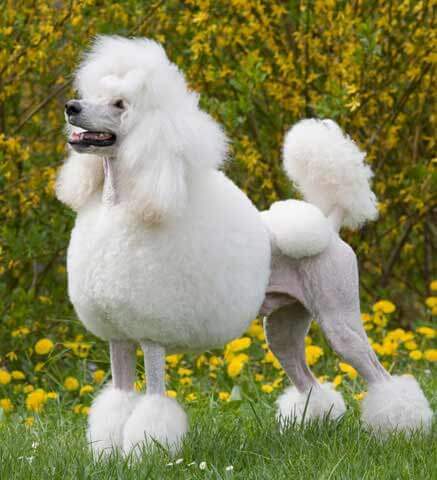 Below are pictures of the Poodle dog breed. This breed is known for having separation anxiety, and it seems to be that the smaller the Poodle, the higher the anxiety. With barking, it's somewhat the same: the smaller the dog, the more the barking. 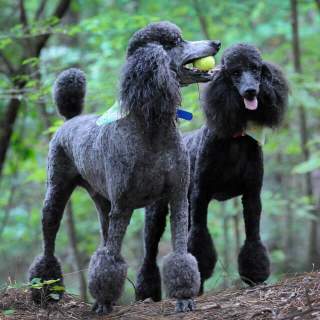 The Standard Poodles tend to be aloof to people, but the Miniature and the Toys are much more prone to bark to make up for their lack of size and outsized fear due to size. It's best to have a fair amount of room, inside and out, for the larger Poodles such as the Standard variety. The smaller variations can do much better in apartments. When outside, Standard Poodles can succumb to their hunting instincts. Toys and Minis might be targeted by wolves, coyotes, and even hawks, so make sure to be ever-vigilant with them when outdoors. This breed is known for being hypoallergenic. While no dog is 100% non-allergic, this is one of the best breeds for people who are allergy sufferers. Poodles are said to be the second-smartest dog breed, and they are also one of the most laughed-at breeds. When it comes to the "ugly Poodle," the term is used as an insult, as a self-deprecating handle on social media, and in ugly dog contests. As a prime example is the winner of the 2018 World's Ugliest Dog Contest. Held in Winchester, California and sponsored by the Saving Huey Foundation, a genetically mangled, 4-pound, 11-year-old primarily Toy Poodle mix named Charlie won that year's undesirable top title. It was not the first time that an ugly Poodle-plus mutt had take home the "Rue" Ribbon. In 2013, when the contest was held in Petaluma, CA, Josie the Poodle/whatever won that year. Of course, we all know about Poodles dressed up as clowns for circus and street acts, Poodles with ridiculously dyed coats for outrageous photographs, and Poodles that win international dog shows or bred for rare coat colors. Flame the Poodle is famous of breeding the red into Labradoodles, and Ricky the Standard Poodle took the Best in Show at the 2014 Crufts. Standard Poodles have a possible genetic defect that can crop up and which affects only a couple or three other breeds. It's called canine Atrial Septal Defect (ASD). This disease has only been recently discovered to target this variation. Hybrid vigor probably helps prevent the ailment in the Minis and Toys. Neonatal Encephalopathy (NEwS) is another condition that's breed-specific. The average lifespan of a Poodle is dependent on the variety, and among the three types can be anywhere from 12 to 15 years.